Analyze why natural resources are being depleted around the world. Describe the various types of environmental pollution that humans produce and their effects. Explain the idea, purpose, and types of renewable energies available. The planet can only support so many people before natural resources begin become depleted and can not support human needs, called Earth’s carrying capacity for humans. Many geographers and other scientists believe that humans have grown beyond earth's carrying capacity; a concept called overshooting. In less developed countries, this has occurred because of population growth; in more developed countries it has to do with our consumption of natural resources. A natural resource is something found within the natural environment that is accessible and economically valuable to humans including food, water, soil, plants, animals, and minerals. But most resources are not renewable, and humans are either consuming them faster than the planet can replenish them or in the case of water and air are polluting them. There are primarily two types of resources: energy and minerals. As noted, a natural resource only has "value" as long as humans need it. As it turns out, humans need more and more energy and mineral resources, resulting in increased costs. There has also been a steady rise in the cost of petroleum, gold, copper, platinum, and titanium. Throughout history, most of the world's energy came from animate power; the use of animals such as mules, ox, and horses. But following the Industrial Revolution, most of the energy in Europe and the United States was used for machinery. The energy used to power the machinery came from inanimate power such as biofuel and fossil fuels. Currently the most used energy source for less developed nations are biofuel such as trees, coal, and methane. But in more developed nations and nations transitioning, fossil fuels have become the central source of energy. So what is fossil fuel? Everything that is or was alive is made out of carbon. Millions of years ago when the planet was a lot warmer, plant life was quite abundant. Over geologic time, these carbon bodies were buried and ultimately converted to fossil fuels (i.e. coal, petroleum, and natural gas). So when you fill your car up at the gas station, you are actually putting ancient plant life into your vehicle. When you drive off, the fuel is burned, and the ancient carbon is released into the environment in the form of carbon dioxide. There are two concerns with fossil fuels. One is that the carbon dioxide released is a greenhouse gas and the other is that it is considered a finite resource. You have probably heard of the recent debate between renewable energy and nonrenewable energy. A natural resource is considered a renewable resource if the nature can reproduce it within a human lifetime. So energy sources such as solar energy, wind power, and geothermal are considered renewable energy sources. Fossil fuels are not considered renewable because it requires millions of years for the earth to replenish them. So ultimately humans will run out of fossil fuels, but the question is when. In terms of coal, the world has well over 200 years worth, but with petroleum the question becomes more complicated. Currently there are over a trillion barrels of petroleum, called proven reserves, that we are aware of with current technology. Potential reserves are resources of petroleum not discovered yet by society. Currently there is a lot of concern about how many reserves of petroleum are left to discover. 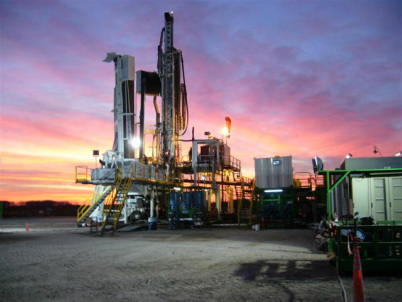 Technology today is allowing industry to discover reserves deeper than ever before and tap into petroleum reserves in ways never allowed before. Another global problem in terms of fossil fuels is that it is not found uniformly around the planet. Coal forms in tropical regions where there are lots of vegetation and swamps. As the vegetation falls into oxygen poor water, it is converted into a carbon-based rock over geologic time. Because of plate tectonics, the slow movement of continents around the planet, most of the mid-latitude countries such as China, Russia, and the United States were located near the equator 250 million years ago. Today these countries have abundant amounts of coal. Petroleum and natural gas forms on the ocean floor under high pressure from overlying water and sediment. Some of these areas are still under water such as in the Persian Gulf and Gulf of Mexico. Other regions are no longer underwater such as the Middle East. Most of the world's sources of fossil fuels exist in more developed countries, which has greatly helped in their development. Today the United States and China are the largest consumers of fossil fuels on the planet. Yet in the 21st century, the demand for coal, petroleum, and natural gas will shift to less developed nations as they move through the demographic transition model. The majority of the world's petroleum prices is determined by As noted earlier, mid-latitude countries such as the United States, Russia, and China have the largest supply of coal. In terms of petroleum, the mission of the Organization of Petroleum Exporting Countries (OPEC) "is to coordinate and unify the petroleum policies of its Member Countries and ensure the stabilization of oil markets in order to secure an efficient, economic and regular supply of petroleum to consumers, a steady income to producers and a fair return on capital for those investing in the petroleum industry." OPEC formed in 1960. Some of you might have also heard about the energy crisis of the 1970s. This occurred when Arab countries of OPEC were angered by the Europe and the United States' support over Israel during the 1973 war with Egypt, Jordan, and Syria. The Arab OPEC members refused to supply oil to the United States, which immediately created a fuel shortage. During the 1980s and 1990s, prices of oil dropped dramatically stimulating global economies all around the world. After the fall of the Soviet Union, Russia struggled to survive as a modern society. But starting in the late 1990s, Russia began exporting its petroleum and coal resources and its political, economic, and military power grew substantially. Cheap fuel in the United States spurred the automotive industry to build large SUVs with low miles-per-gallon. But the mid-2000s saw a sharp increase in fuel prices with record prices occurring in the summer of 2008. Following the summer of 2008, SUV sales plummeted risking the possibility of Ford and GM becoming extinct. With the increase of oil the last few years, there has been a desire to find alternatives. There has been a sharp increase natural gas vehicles because natural gas is cheaper and pollutes less than oil. But basic economics of supply and demand state that as natural gas is used more (demand), cost is likely to follow. Since the world has plenty of coal to last hundreds of years, some have pushed more coal burning. But there are several environmental concerns with coal. First, coal is the "dirtiest" fossil fuel in terms of air pollution. Burning coal releases vast amounts of sulfur, which creates acid rain and mercury which damages our neurological system. But it also releases the largest amount of carbon dioxide which is a greenhouse gas. With the current concern with global warming, there has been a lot of talks about carbon sequestration. The idea behind this is that if humans can capture the carbon dioxide before it is released, we might be able to "lock" it deep within the earth and thus preventing it from contributing to global warming. But the technology here is far from proven yet. A third source of nonrenewable energy is nuclear. 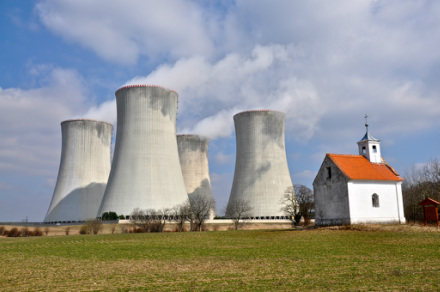 Since Chernobyl in 1986 in the former Soviet Union and the Three-Mile Island incident in the United States, our country has been very apprehensive in creating new nuclear power plants. The benefit of nuclear power is that incredible amounts of energy can be generated without polluting the environment. But there are serious concerns about potential accidents and the radioactive waste it generates. There has been recent heated debate in the West as to where to store radioactive waste. In Utah, there has been talk of storing nuclear waste at the Goshute Indian Reservation as a short-term stop to Yucca Mountain in Nevada. But many in Utah believe that a nuclear waste, which takes tens of thousands of years to decompose, in Utah will never leave even though we don't have a nuclear power plant. In Nevada, there is concern about the actual safely of storing nuclear waste in a mountain with nearby fault lines. And after the September 11 terrorist attacks, there is renewed interest of nuclear power plants becoming targets. Pollution of the environment occurs when humans contaminate the air, water, or land. Pollution can also be broken down into two categories: primary and secondary. Primary pollution is when humans directly contaminate the earth in some manner. Examples include mercury, sulfur, and even carbon dioxide. Secondary pollution happens when a primary pollutant reacts with another primary pollutant, sunlight, and/or water to create a different pollutant. An example is acid rain. Sulfur dioxide is a primary pollutant, but when it reacts with precipitation is becomes a secondary pollutant called acid rain. One of the biggest problems with pollution is that those who pollute are usually not the ones affected by it; rather the down-winders are. The atmosphere is mostly made of 78 percent nitrogen, 21 percent oxygen, and small percent’s of other trace molecules such as ozone, carbon dioxide, water vapor, and aerosols. Air pollution occurs when humans add unnatural substances into the atmosphere. Most of the air pollution from industry comes from coal while automotive pollute vast amounts of ozone, carbon dioxide, and sulfur into the atmosphere. But in the 1970s the United States created the Clean Air Act, which has greatly enhanced the quality of our nation’s air. Check out this video from National Geographic on the world's air quality. Those who pollute are usually not the ones affected by it. Industrialization in eastern North American and eastern Europe have generated large-scale pollutants such as sulfur oxides and nitrogen oxides through the burning of fossil fuels. When these pollutants react with water, they form acid precipitation. Acid precipitation can cause large-scale damage to aquatic life and forests by making the vegetation very sick and dying. In forests, this can lead to disease through pest infestation. Acid precipitation can also damage or destroy buildings and monuments made out of marble such as tombstones. This is a very complicated issue to discuss in this short section, but here we go. In the scientific community, there is very little discussion if anthropogenic climate change, also called global warming, is happening or if it's human induced. What scientists are now focusing on are what the possible effects might be. The earth has gone through dramatic climatic changes from temperatures much warmer today to ice ages. There are several reasons for climatic shifts, but they include changes in earth's orbit and tilt around the sun and the movement of continents. Recently scientists have stated that the planet is beginning to warm up because of the greenhouse gases humans are emitting into the atmosphere. We know that carbon dioxide is a greenhouse gas, and we are quite grateful for the greenhouse effect. Without the greenhouse effect, humans could not live on this planet. The basic idea with the greenhouse effect is that the earth absorbs energy coming from the sun. When the earth tries to re-radiate this energy back into space, specific gases can actually trap the heat in our atmosphere. Scientists are stating, with empirical data backing their claims, that by adding more greenhouse gasses such as carbon dioxide into the atmosphere the earth has the ability to absorb more outgoing energy, which will make the planet get warmer. What scientists now know is that there is more carbon dioxide in the atmosphere today than in the last 1,000,000 years and by 2100 there will be more carbon dioxide than there has been in the last 65 million years. To learn more about climate change, check out NOAA's National Climate Data Center. In the 1920s, humans developed a chemical called chlorofluorocarbons (CFCs) for things such as refrigerating and air conditioners. But in the 1970s, two American scientists discovered that these CFCs were weakening the ozone hole. What they learned is that when the CFC's reach the layer of the ozone hole, the ultraviolet radiation from the sun breaks the chlorine off which can attach and destroy over 100,000 ozone molecules and continue in the upper atmosphere for over 100 years. Over time and much debate, the world got together and signed the Montreal Protocol in 1987 to phase out CFCs. Today, most industrialized countries have eliminated the use of CFCs, but the ozone hole is not required to heal for another 50-100 years. Learn more about what's currently going on with the ozone hole at NASA's Ozone Hole Watch. Water is the most valuable resource on the planet, but humans keep polluting it in various ways. Manufactures use water to create and process food. Vast amounts of water is polluted by farmers through fertilizer and waste from pigs and cows in unhealthy feed lots. Where does the water go when you pour it down the gutter? Most of the time into a river or ditch. So when you wash your car in the driveway, you are polluting your local water. Water pollution can greatly harm aquatic life in rivers, lakes, and the ocean. Many of the fertilizers in farmers and the cleaners we use can create algae blooms in our local rivers. When the algae dies, it can also remove the oxygen from the water which can kill fish and other aquatic life. These are called dead zones and one of the biggest in the world is forming in the Gulf of Mexico because of the pollution in the Mississippi River. Just like our air, the nation's water has greatly improved since the 1970s because of the Clean Water Act. The country has seen a dramatic increase in recycling because of the interest of solid waste disposal and that our landfills are filling up. Not only is there concern for our national landfill waste, but how chemicals are seeping from our landfills are also polluting our groundwater. Humans cannot sustain the path we've been taking with our consumption of resources and global population expected to peak at 9 billion by 2050. We need to learn how to live differently without decreasing our quality of life. One such possibility is to move towards a renewable energy economy. The following are the diverse types of renewable energy. Biomass is when humans burn vegetation as a fuel source. Many argue that this not a viable option for human energy consumption. Burning biomass releases large amounts of carbon dioxide into the atmosphere and requires the destruction of ecosystems such as deforestation. There has also been a recent push for ethanol as a "green" source of energy. In the United States, corn has been used and subsidized to make ethanol. The effects have been a spiraling rising in the cost of corn-based food. Plus many would argue that humans should not be using food for fuel when humans are now consuming more food than we are producing. In Brazil, they are using sugarcane to produce ethanol. Because there is a lot of money to be made in the ethanol industry, Brazil is cutting down the Amazon rainforest to produce more sugarcane for their energy economy. So it can be argued that ethanol is not really a "green" energy if it requires deforesting the rain forests along with causing food prices to rise. Hydroelectric power is also questionable as an energy source even though it is renewable. 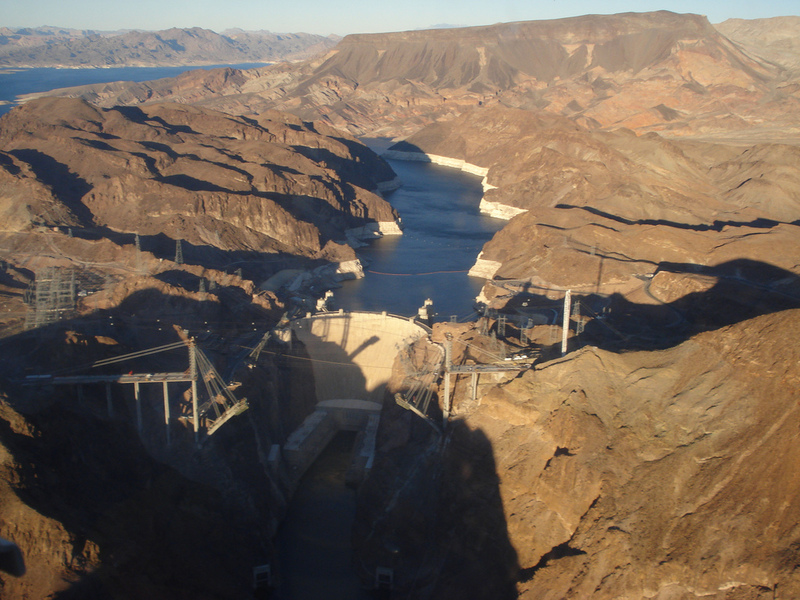 Hydroelectric power requires dams being built in order for flowing water to turn turbines within the dam to generate electricity. Their are numerous problems with power coming from hydroelectric dams. It requires flooding usable and often time fertile land to create a lake. 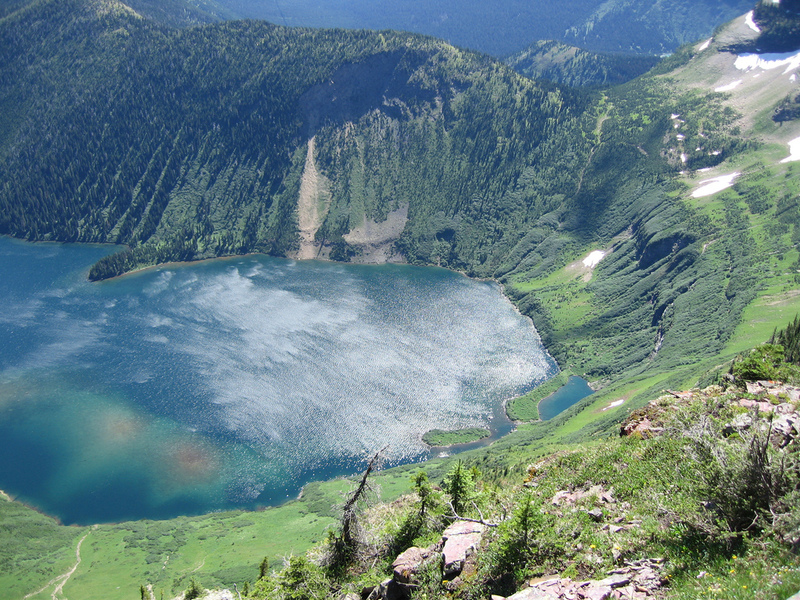 Over time, the lake can fill up as sediment gets deposited into the lake. Dams can also harm aquatic wildlife such as salmon because the prevent them from returning to their spawning locations. In fact, many northwestern states in American have dismantled damns because salmon are near extinction. But it must be said that it is "clean" energy in that hydroelectric power does not pollute the air or water. Windmills have been around for hundreds of years, but only recently have they been used to generate electricity. 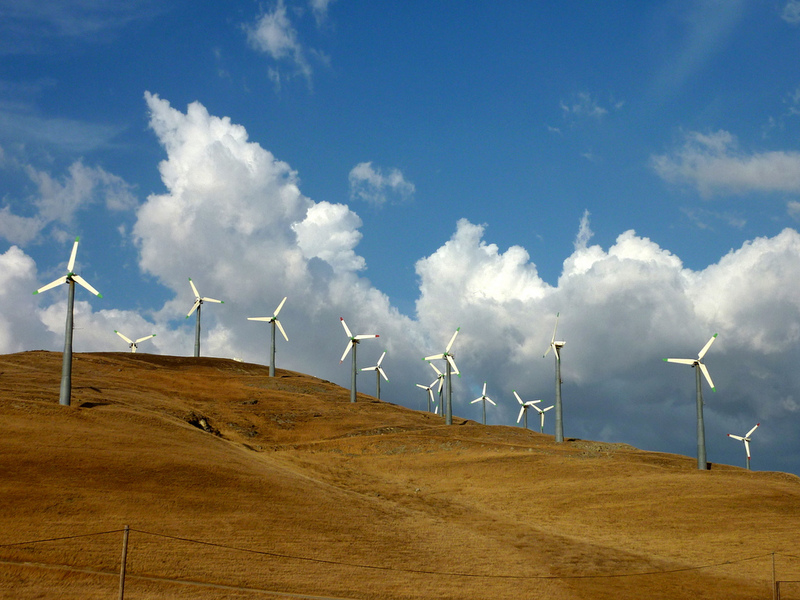 Until last year, wind power was the fastest growing energy source in the world. And with the rising costs of fossil fuels, wind power is now cheaper to produce than energy from fossil fuels. Farmers are getting onboard with wind power because power companies will rent space to place the windmills, which will provide a steady income for the farmer. But the farmer can still grow their crops or have their cattle and maintain their way of life. Energy created by wind is similar to dams because the wind turns the blades, which turns a turbine within the windmill to generate electricity. There are a few concerns with wind power though. Some do not like how windmills look because they require being out in the open; whereas coal power plants are easier to hide behind mountains. There is also concern that windmills, can harm migratory birds and bats. But wildlife is more likely to be hurt by changing climates than by small-scale windmills. Now out in Europe, they have been real serious about wind power. Some of the windmills along the continental shelf - where the winds are steadily consistent - have windmills so large you can land a helicopter on them. They are so large that each blade is over 300 feet long (said another way, each blade is taller than the Statue of Liberty). The United States is still far behind other countries in Europe, but that is starting to change. It is now possible to purchase wind power from various energy companies. The largest wind power program in the United States is called the Blue Skies Program by Rocky Mountain Power. The Earth's interior is still extremely hot because of Earth's formation. A new technique being implemented is to use water and the internal heat the earth to produce steam, which can turn turbines to generate electricity. It requires using existing ground water or actually pumping ground water into the earth so the heat can evaporate the water into steam and turn a turbine. The image below is a geothermal plant in Iceland where they plan to use the heat from their volcano (Iceland is a volcanic island) to power their entire country. With the sun still having 5 billion years of life in it, our star is the ultimate renewable energy source. There is actually two types of solar energy: passive and active. Passive solar energy requires no special devices, rather south-facing windows and dark surfaces to light and heat buildings. This is a very inexpensive alternative, and it is surprising that it is not used more often. Active solar energy captures heat and generates electricity by using photovoltaic cells with solar panels. The panel's cells are made from silicon which is the second most abundant mineral on Earth's crust and when combined with other materials become sensitive to sunlight - called the photovoltaic effect. The electrons within the cells move through the silicon and produce an electrical current. 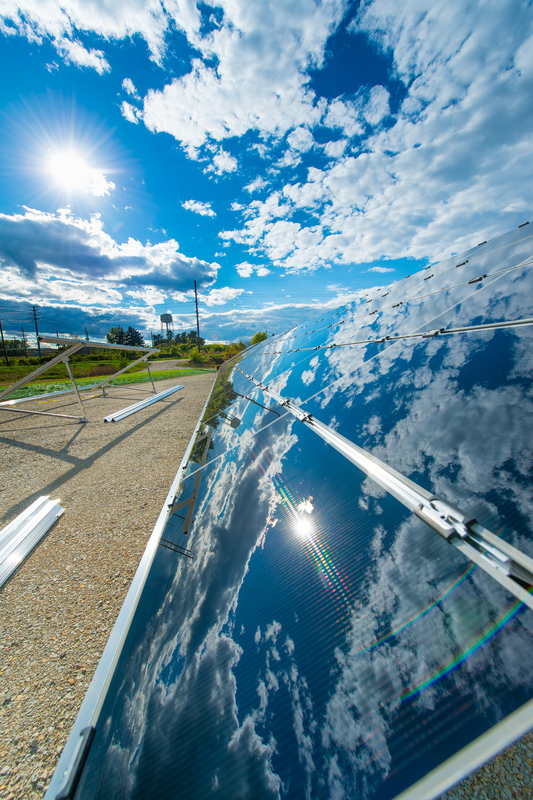 In 2008 solar panels surpassed windmills as the fastest growing energy source in the world. As you probably noticed with the different types of renewable energy, most require turning a turbine to generate electricity. Renewable energy is being used to supply electricity into the grid system for all the appliances that require electricity. Another use of renewable energy is for water heaters which require vast amounts of energy. In less developed nations, renewable energy such as solar panels is being used to provide electricity to people who are not connected to a grid system. There is also a new movement to include solar panels to the tops of hybrids and electric cars. In 2009, the new Toyota Prius will have an upgrade option to have solar panels on the top to charge the battery. There has also been a steady demand to recycle rather than through products into our landfills. But recycling is not only about saving landfill space, it's about water, natural resources and energy. It requires a lot less energy, water, and resources from the earth to re-create something than to mine and process the raw material. Take a soda can. How long do you keep a soda can once you open it? Did you know that it may take up to three years for the material to be mined from the mountain, processed, shipped, filled with soda, and shipped to you? That is a lot of power, yet if you recycle products then there is more savings than just landfill space. There is now a variety of ways someone can recycle. 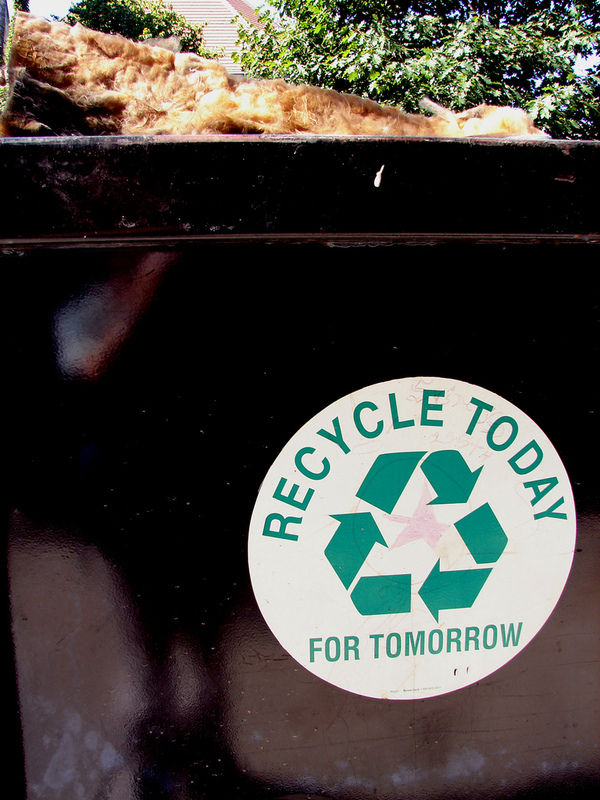 Many cities around the nation have curb-side recycling much like your garbage cans. There are also several drop-off sites, which are often found at retail and grocery stores. Buy-back centers are commercial businesses that purchase your recyclable goods. But it is important to note that what you can recycle for each can vary - so don't think you can dump anything you want into a recycling can just because you see one. So once you recycle something, where does it go? There are four major manufacturing sectors that account for over half of the world's recycled products - paper mills, plastic converters, steel mills, and iron factories. The easiest items to make from recycled material is newspaper, paper towels, aluminum cans, steel, and glass. The problem with recycling comes with plastics because there are so many different types, and they can't be mixed in the recycling process. Many of you are aware that, at the bottom of plastic containers, there is a number from 1-7; these are different types of plastics. But you cannot recycle plastics of various types; they must be sorted out. If a #5 is mixed within a batch of #2 plastics, the entire batch is ruined. So make sure you are conscious of what you are doing when you recycle. Now some recycling companies have the ability to sort through the different types of plastics; so check with your recycling company if you are not sure which plastics you can recycle. This chapter focused on the human-environment connection. More specifically, it looks module will look at the direct impacts humans have on the planet. I have always believed that the greatest strength of geography is its ability to analyze the interconnection between humans and the planet. Recently humans have reached a critical point on the planet where we are consuming more natural resources than is sustainable on the planet.